Habka Isgaarsiinta Caalamiga ee teleefonada gacanta (Af-Ingiriis Global System for Mobile Communication markii la soo gaabiyo GSM (Soo gaabintiisa asalka ah: Groupe Spécial Mobile) waa farsamo iyo shuruuc la dejiyay taasoo sababtay in telefoonada gacanta ee caalamka ee isu soo dhawaadaan oo ay sahlaan in horumarintooda lagawada qaybqaato. Magaca GSM waa magac loo bixiyey koox la dhisay sanadka markii uu ahaa 1982 looguna talagalay in ay sameyo shuruuc (standard) midaysan, oo noqda mid wada mideeysa dhamaan isgaarsiinta teleefonada gacanta ee qaarada yurub lana siiyo fursad ay wadamada kale kaga faa'ideystaan. Sistamkaasna waxaa loo qorsheeyay in uu ku shakheeyo hirarka 900 MHz. Isticmaalka teleefonada gacanta waa teknoolojiyada isgaarsiinta uu horemarkeeda aad u socdo dadka dunida ku nool waxaa ka isticmaala inku dhow 30% (Diseembar 2006) taasoo u dhiganta labo miliyardi oo qof waxaana lagu isticmaalaa 212 dowladood iyo dhullal dowlad raacsan  ..
GSM:ka wuxuu kaga duwanyahay teleefonadii gacanta ee ka horeeyay dhinaca siinyaaleyta (signaling) iyo kanaalada codka oo ah kuwo dhigitaal ah, taasoo keentay in loo aqoonsado jiilkii labaan (2G, Second Generation) ee sigaarsiinta teleefonada gacanta. Helitaanka teleefonada gacanta ku salaysan GSM:ka laga helikaro meelo aad u badan ayaa waxay abuurtay awooda ay shirikadaha teleefonada gacanta (GSM) ay u martigelinkaraan macaamiisha shirikadahakale ee ka jira meelaha ama wadamada aysan shirkadooda ka shaqeynin. Iyadoo la'isticmaalayo farsamada loo yaqaano roaming oo ka timid ereyga ingiriiska ee roam oo uu macnahiisu yahay socsocod aanan la qorsheysanin. Haddii ay shirkada A la sameyso heshiis martigelis (=roaming) shirikada B, waxaa macaamiisha shirkada A u suurtogaleyso in ay teleefonadooda ku isticmaalaan qadadka ay leedahay shirkada B.
FG (Fiiro Gaar ah): Waa in heshiiska ka dhaxeeyo isticmaalaha iyo shirkadiisa uu saamixikaro in teleefonada uu dirsado loogu soo dalicirako si biil ahaan ah oo aysan ahayn mid horay loo bixiyey (PREPAID). Haddii isticmaalaha loo soo diro teleefooon asaga oo jooga meel uu ka shaqeeyo shirkada uu martida u yahay waxaa ku socda lacag. Digniin: Isticmaalaha shirkada A oo martida u ah shirkada B ma'ogaankaro qiimaha ay shirkada B ku so dalicidoonto halkii taqiiqo oo uu ku hadlo teleefoonka, waana arinta ugu xun ee hada ka jirto isicmaaladia farsamada martielinta (Roaming). "GSM" redirects here. For other uses, see GSM (disambiguation). This fact has also meant that data communication was built into the system from the 3rd Generation Partnership Project (3GPP). Haddii laga fiiriyo dhinaca isticmaalayaasha faa'iidada istamka GSM:ka waa asaga oo leh cod dhijitaal ah oo ay tayadiisu sareyso qqimahiisuna jabanyahay, wuxuuna saamaxaayaa in ay isticmaalayaasha isu tiraan fariimo gaagaaban (160 xaraf) oo loo yaqaano SMS (Simple Massaging Sysyem). Fa'iidada shirkada teleefonada ayaa waxay tahay ayaga oo awooda in ay qalabkooda ka soo iibsadaan shirkado kalagedisan, maadaama uu sistamku yahay mid caalami ah. Horumarinta sistemka waa sii soctaa, wuxuuna suurtogelinayaa in noocyadii hore ee teleefonada ay la'shaqeeyaan ku cusub oo ay kamid yihiin sida kuwa internetka loo isticmaalikaro oo wata teknoolojoyida GPRS (General Packge ??? System). As the GSM standard continued to develop, it retained backward compatibility with the original GSM phones; for example, packet data capabilities were added in the Release '97 version of the standard, by means of GPRS. Higher speed data transmission has also been introduced with EDGE in the Release '99 version of the standard. Fikrada guud ee teleefonada gacanta waa ayaga oo isticmaalaya awood (Power) aad u yar marka uu qadka furanyahay. Haddii loo fiiriyo awoodaas awoodaha ay raadiyoyaasha ciidamada ay kuwada xiriiraan waxaa u dhaxayso farqi aad u wayn (1/10000). GSM is a cellular network, which means that mobile phones connect to it by searching for cells in the immediate vicinity. GSM networks operate in four different frequency ranges. Most GSM networks operate in the 900 MHz or 1800 MHz bands. Some countries in the Americas (including the United States and Canada) use the 850 MHz and 1900 MHz bands because the 900 and 1800 MHz frequency bands were already allocated. The rarer 400 and 450 MHz frequency bands are assigned in some countries, notably Scandinavia, where these frequencies were previously used for first-generation systems. In the 900 MHz band the uplink frequency band is 890-915 MHz, and the downlink frequency band is 935-960 MHz. This 25 MHz bandwidth is subdivided into 124 carrier frequency channels, each spaced 200 kHz apart. Time division multiplexing is used to allow eight full-rate or sixteen half-rate speech channels per radio frequency channel. There are eight radio timeslots (giving eight burst periods) grouped into what is called a TDMA frame. Half rate channels use alternate frames in the same timeslot. The channel data rate is 270.833 kbit/s, and the frame duration is 4.615 ms.
GSM has used a variety of voice codecs to squeeze 3.1kHz audio into between 6 and 13kbps. Originally, two codecs, named after the types of data channel they were allocated, were used, called "Full Rate" (13kbps) and "Half Rate" (6kbps). These used a system based upon linear predictive coding (LPC). In addition to being efficient with bitrates, these codecs also made it easier to identify more important parts of the audio, allowing the air interface layer to prioritize and better protect these parts of the signal. GSM was further enhanced in the mid-nineties with the GSM-EFR codec, a 12.2kbps codec that uses a full rate channel. Finally, with the development of UMTS, EFR was refactored into a variable-rate codec called AMR-Narrowband, which is high quality and robust against interference when used on full rate channels, and less robust but still relatively high quality when used in good radio conditions on half-rate channels. There are four different cell sizes in a GSM network - macro, micro, pico and umbrella cells. The coverage area of each cell varies according to the implementation environment. Macro cells can be regarded as cells where the base station antenna is installed on a mast or a building above average roof top level. Micro cells are cells whose antenna height is under average roof top level; they are typically used in urban areas. Picocells are small cells whose diameter is a few dozen meters; they are mainly used indoors. On the other hand, umbrella cells are used to cover shadowed regions of smaller cells and fill in gaps in coverage between those cells. Cell radius varies depending on antenna height, antenna gain and propagation conditions from a couple of hundred meters to several tens of kilometers. The longest distance the GSM specification supports in practical use is 35 km or 22 miles. There are also several implementations of the concept of an extended cell, where the cell radius could be double or even more, depending on the antenna system, the type of terrain and the timing advance. Indoor coverage is also supported by GSM and may be achieved by using an indoor picocell base station, or an indoor repeater with distributed indoor antennas fed through power splitters, to deliver the radio signals from an antenna outdoors to the separate indoor distributed antenna system. These are typically deployed when a lot of call capacity is needed indoors, for example in shopping centers or airports. However, this is not a prerequisite, since indoor coverage is also provided by in-building penetration of the radio signals from nearby cells. The modulation used in GSM is Gaussian minimum shift keying (GMSK), a kind of continuous-phase frequency shift keying. In GMSK, the signal to be modulated onto the carrier is first smoothed with a Gaussian low-pass filter prior to being fed to a frequency modulator, which greatly reduces the interference to neighboring channels (adjacent channel interference). A nearby GSM handset is usually the source of the "dit dit dit, dit dit dit, dit dit dit" signal that can be heard from time to time on home stereo systems, televisions, computers, and personal music devices. When these audio devices are in the near field of the GSM handset, the radio signal is strong enough that the solid state amplifiers in the audio chain function as a detector. The clicking noise itself represents the power bursts that carry the TDMA signal. These signals have been known to interfere with other electronic devices, such as car stereos and Ipods. This is a form of RFI, and could be mitigated or eliminated by use of additional shielding and/or bypass capacitors in these audio devices, however, the increased cost of doing so is difficult for a designer to justify. The network behind the GSM system seen by the customer is large and complicated in order to provide all of the services which are required. It is divided into a number of sections and these are each covered in separate articles. all of the elements in the system combine to produce many GSM services such as voice calls and SMS. One of the key features of GSM is the Subscriber Identity Module (SIM), commonly known as a SIM card. The SIM is a detachable smart card containing the user's subscription information and phonebook. This allows the user to retain his or her information after switching handsets. Alternatively, the user can also change operators while retaining the handset simply by changing the SIM. Some operators will block this by allowing the phone to use only a single SIM, or only a SIM issued by them; this practice is known as SIM locking, and is illegal in some countries. In the United States, Europe and Australia, many operators lock the mobiles they sell. This is done because the price of the mobile phone is typically subsidised with revenue from subscriptions and operators want to try to avoid subsidising competitor's mobiles. A subscriber can usually contact the provider to remove the lock for a fee, utilize private services to remove the lock, or make use of ample software and websites available on the Internet to unlock the handset themselves. While most web sites offer the unlocking for a fee, some do it for free. The locking applies to the handset, identified by its International Mobile Equipment Identity (IMEI) number, not to the account (which is identified by the SIM card). It is always possible to switch to another (non-locked) handset if such other handset is available. Some providers will unlock the phone for free if the customer has held an account for a certain period. Third party unlocking services exist that are often quicker and lower cost than that of the operator. In most countries removing the lock is legal. Cingular and T-Mobile provide free unlock services to their customers after 3 months of subscription. In countries like Pakistan,India, Belgium, etc., all phones are sold unlocked. However, in Belgium, it is unlawful for operators there to offer any form of subsidy on the phone's price. This was also the case in Finland until April 1 2006, when selling subsidized combinations of handsets and accounts became legal though operators have to unlock phone free of charge after a certain amount of time (at most 24 months). 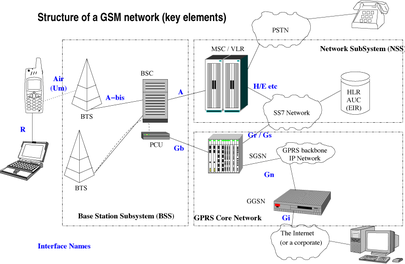 GSM was designed with a moderate level of security. The system was designed to authenticate the subscriber using shared-secret cryptography. Communications between the subscriber and the base station can be encrypted. The development of UMTS introduces an optional USIM, that uses a longer authentication key to give greater security, as well as mutually authenticating the network and the user - whereas GSM only authenticated the user to the network (and not vice versa). The security model therefore offers confidentiality and authentication, but limited authorization capabilities, and no non-repudiation. GSM uses several cryptographic algorithms for security. The A5/1 and A5/2 stream ciphers are used for ensuring over-the-air voice privacy. A5/1 was developed first and is a stronger algorithm used within Europe and the United States; A5/2 is weaker and used in other countries. A large security advantage of GSM over earlier systems is that the Ki, the crypto variable stored on the SIM card that is the key to any GSM ciphering algorithm, is never sent over the air interface. Serious weaknesses have been found in both algorithms, and it is possible to break A5/2 in real-time in a ciphertext-only attack. The system supports multiple algorithms so operators may replace that cipher with a stronger one. Boggan waxaa markii ugu dambeysay wax laga bedelay 15:16, 30 Jannaayo 2017.